Are you looking for a Kosher wedding in Spain? Are you looking for that magical formula of sunshine, spectacular scenery, a breathtaking venue, amazing food and a wedding planner that understands Jewish traditions and is licensed for Kosher catering? Then you are in luck, as Sunshine Weddings Spain has just been awarded a certification of Kashrut and will be working exclusively with the recent Michellin star awarded Marc Fosh catering on the island of Mallorca. For thirteen years the Sunshine Weddings team has been planning and hosting kosher events and Jewish weddings for happy couples across Spain and the Balearic islands. Tish – an opportunity for the men to meet prior to the ceremony and have fun, while drinking whisky, singing and dance. Bedeken – dating back to the time of Jacob marrying the wrong sister, it is customary before the ceremony for the Rabbi to lead the groom and fathers to the waiting bride and mothers, where the groom lifts the vale and checks that he is marrying the right bride. Chupah – this elaborate canapé , under which the Jewish couple marry, must have four corners to represent the home. The men of the wedding party (fathers and grandfathers) stand on one side and the mother/grandmothers stand on the female side. Horah – This is a traditional Israeli circle dance where all the males will dance together whilst the females will do the same. In recent years the males have created more dancing games as the images show is all about fun at a joyous occassion. 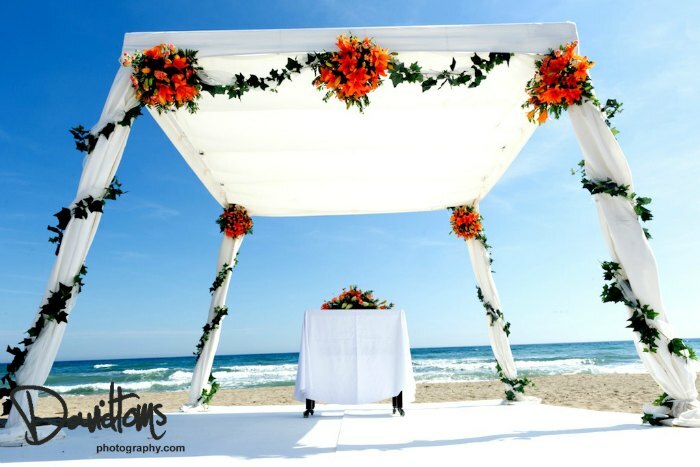 Sunshine Weddings Spain is proud to offer Kosher events and wedding in the South of Spain, Barcelona and now Mallorca. We do hope we will be able to offer you the magical formula for your unforgettable Jewish wedding too!